Goodspeed continues to make the best musical comedies even better. The production qualities of such classics as "Babes in Arms," "Me and My Girl" and "The Boy Friend" - at Goodspeed in the past decade - are equaled by those in "My One and Only." Considering that the familiar music is by Who's Who of 1940s composers (in this case, the Gershwins), and the dancing is "wow," it's no surprise that this energetic, excellent show is up to the exceedingly high standard as its Goodspeed predecessors. Here's another inane plot of boy meets girl - boy is a hick pilot and girl is a swimming champ (think: pretty Gertrude Ederle). At first, it seems as if Tony Yazbeck (our hero) is primarily a dancer who can also sing. After all, his opening song is the not very difficult "Blah, Blah, Blah." Correction, once he is assigned more melodies, capped by the stirring "Strike Up the Band," it's obvious that Yazbeck excels at song and dance equally. Gabrielle Ruiz (our "little fish") is to be complemented on her vocal skills which are similar to those of Julie Andrews, particularly in "S'Wonderful." While her dancing cannot be judged, because she has little to do, lacking was charm and charisma. Ruiz's character didn't seem worthy of the affable hick. Other characters fill out the bill, particularly the versatile and funny "Greek Chorus" quartet who becomes reporters, preachers, barbers, etc. throughout the story. The side plot of the snidely bad guy (with thick accent and mustache) and female mechanic is adorable. Alde Lewis, Jr. (Mr. Magix, relationship advisor) gives a standout performance the minute that he literally stands up from his chair. His Magix has a suave air and dry sense of humor, with tap dancing feet that create a capella music. The title song and very long tap and soft-shoe number by Yazbeck and Lewis is the showstopper. The audience reaction indicated that the piece wasn't long enough - give 'em more. But there's lots more, and now enough room to write about the 3D movie-like set, the array of costumes, and the choreography. Goodspeed follows the adage of truth in advertising. 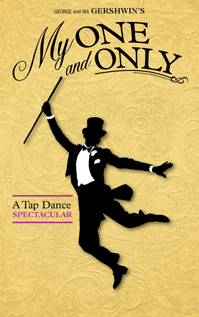 Billed as a "tap dance spectacular" - it certainly is!